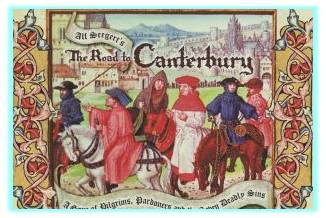 2. estates satires, though it is difficult to say for certain which of these Chaucer knew. Probably he had read the Latin and the French satires included by his friend John Gower in his Vox Clamantis. The Mirrour de l’omme and the French Roman de Carite are influential. Langland's Vision of Piers Plowman is a direct model for the A-text. Both have ideal ploughmen, thriving merchants, priests who ran off to London chantries to sing for silver, friars who wear fineries and absolve sinners for cash, a venal pardoner, rich sergeants-at-law, a group assorted citizens, mostly cloth workers c.f the haberdasher, dyers and tapicere, even the Wife. 3. Boccaccio's Decameron has been cited to be one of the sources, but has not been confirmed. 4. Novelle, by Giovanni Sercambi.